On Tuesday, March 29, Tricia Burke, interpersonal communication scholar and assistant professor in the department of communication studies at Texas State University joined the Wittenberg Communication Department for its annual spring colloquium. Burke, brought to Wittenberg by professor Katie Warber, “is a long-time friend of hers,” Warber said, who received her Bachelors, Masters and Ph.D. from the University of Arizona. 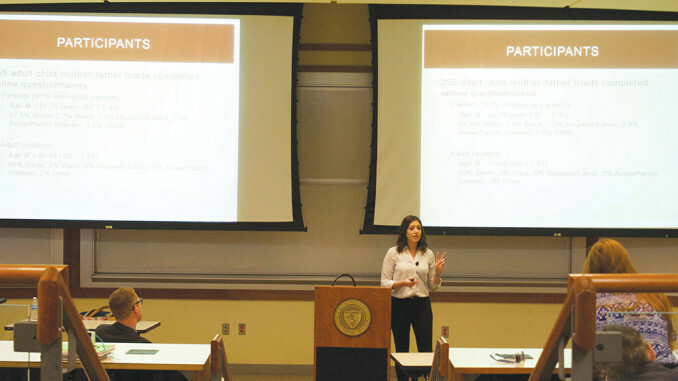 Introduced by Sarah Predmore, ’16, Burke “teaches graduate classes currently at Texas State University.” Burke began in her lecture, focusing on “family communication on diet and couples’ communication about diet and exercise,” Predmore added. Burke’s work has been mentioned in relationship blogs, the “Today Show” and the Wall Street Journal. “When you feel really supported, that can physiologically make you feel calmer,” said Burke, in reference to the part of stress that reflects our innate need to feel a sense of belonging. Burke’s research found that people who are learning better social skills in their home lives have better outcomes with their psychosocial health – supporting social learning theory. Thus, less loneliness or anxiety in parents resulted in less loneliness or anxiety in adult children. The research helped Wittenberg students to consider how to combat the natural stress one feels as they make the transition to college. “Engaging in conversation with your parents during college transition can help combat loneliness and depression,” Burke said. Burke’s colleague, Michael Burns, also had the opportunity to present to students in the first year seminar classes, sharing research with students who more recently have undergone the transition to college. Stephanie Glass, ’18, had the opportunity to join Burke for lunch, in which she felt Burke “was very personable and willing to answer any questions,” with both Burke and Burns “giving me advice that was super beneficial to someone interested in master classes,” Glass said. “After the speech, I saw value in the fact that at Wittenberg, we have to take both methods courses. When she was talking about her procedure, I actually understood the methodology behind it,” Glass added. Communication major Lauren Duraj, ’16, felt similar sentiments as the colloquium was “one of her favorites,” she said. “Her research focused on areas that I think every college student has experienced. “It was nice to see a lot of my prior communication knowledge from courses come together in the real world application of Dr. Burke,” Duraj added. Burke’s research can be found in various peer-reviewed journals, including Health Communication, Journal of Family Communication, Journal of Social and Personal Relationships, and Communication Monographs, to name a few.